Opening Reception! Meet the Artists of ROCKED & ROLLED! Cash bar by Embers Tap House. 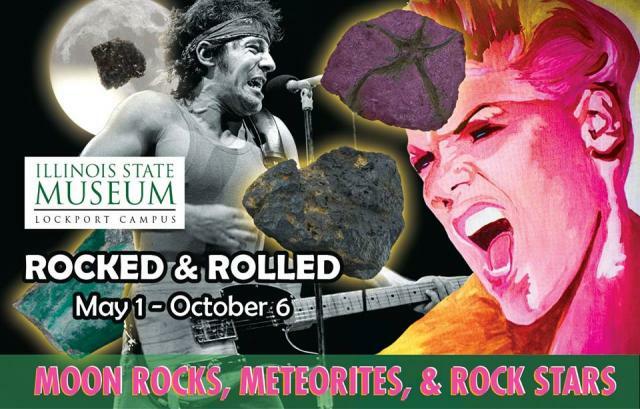 What happens when you pair music themed art, photography and installations with rocks, minerals and fossils from the Illinois State Museum Geology Collections. Kicking off the Summer exhibition with the artists meet and greet. All are welcome and invited to join us. Participating artists include: Judie and Bill Anderson, Patty Ratzel, Chris Young, Yams, Christine Duray, Warren Linn, Larry Brogan, Dylan Fish, Plastic Crimewave, John Spear, Mac Blackout, Princess Etch-A-Sketch, Donna Castellanos, Ian Sherwin, Erika Iris, Jim Stark, Dan McAdams, Melina Ausikaitis, Robin Power, Lee Grantham, Kelly Eddington, Smashed Plastic Records, Crosshair Silkscreen Design.